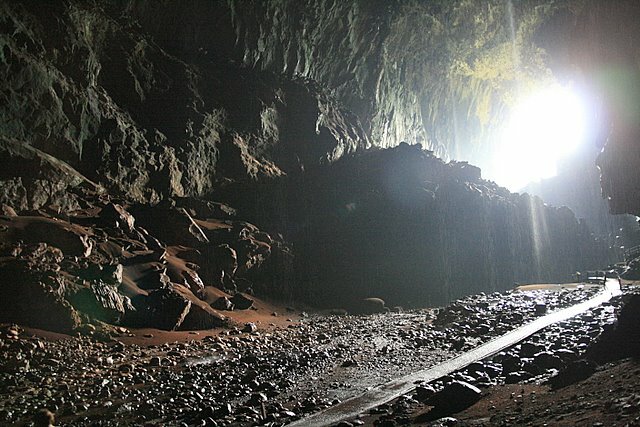 From Why Art Cannot Be Taught: “There is a cave chamber in Sarawak so large that it could hold five football fields—the largest subterranean chamber in the world. When it was first discovered, the spelunkers had no idea what to expect. They were walking up an underground stream when the walls diverged and left them staring into darkness. The room is so large that their headlamps could not pick out the ceiling or the walls, and they spent the next sixteen hours working their way around the room, keeping close to the right-hand wall, intending to keep going until they got back to the entrance. At times they were fooled by “house-size” boulders that they mistook for walls of the chamber, only to find that they were giant boulders fallen from the ceiling. At one point one of the cavers panicked, but eventually they all got out. Pictures taken on later surveying expeditions show the spelunkers’ lights like little fireflies against a measureless darkness.